The nation depends on emergency responders to preserve the public’s safety and health when disasters strike. To successfully meet this challenge, emergency responders must be protected from the hazardous conditions that disasters and other emergencies create. A plan for monitoring emergency responder health and safety is an important part of protecting them. 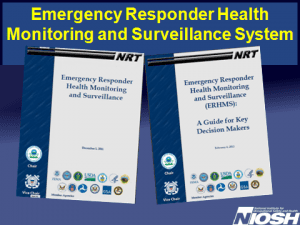 Recognizing this, NIOSH worked with the U.S. National Response Team (NRT), and a number of federal agencies, state health departments, labor unions, and volunteer emergency responder groups to develop the Emergency Responder Health Monitoring and Surveillance (ERHMS) system. The ERHMS consists of an NRT Technical Assistance Document and A Guide for Key Decision Makers. The ERHMS provides guidelines for protecting emergency responders over a full range of emergency types and settings. It is for use by all who are involved in the deployment and protection of emergency responders. This includes incident management and response organization leadership, health, safety and medical personnel, and emergency responders themselves.